With this guide, you will learn how service amount is calculated based on price type, price policy, and price adjustment settings, and how the subtotal amount and the total amount of inspections and work orders is calculated based on the amount of selected services. 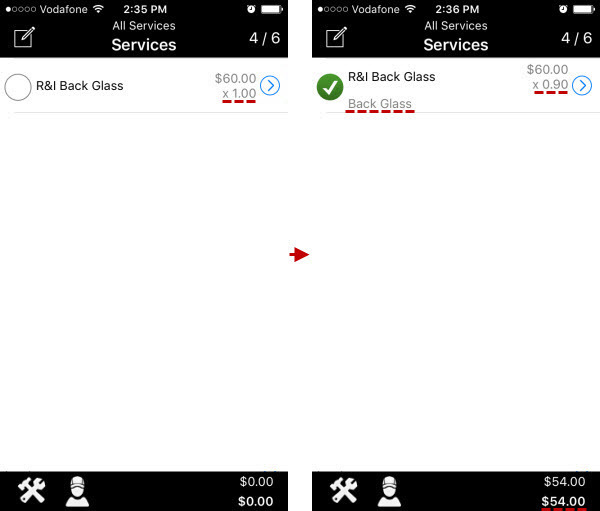 Service price type defines how service amount is calculated as well as whether a service can include other services. Note The list of available price types depends on the features your Back Office application is subscribed to. 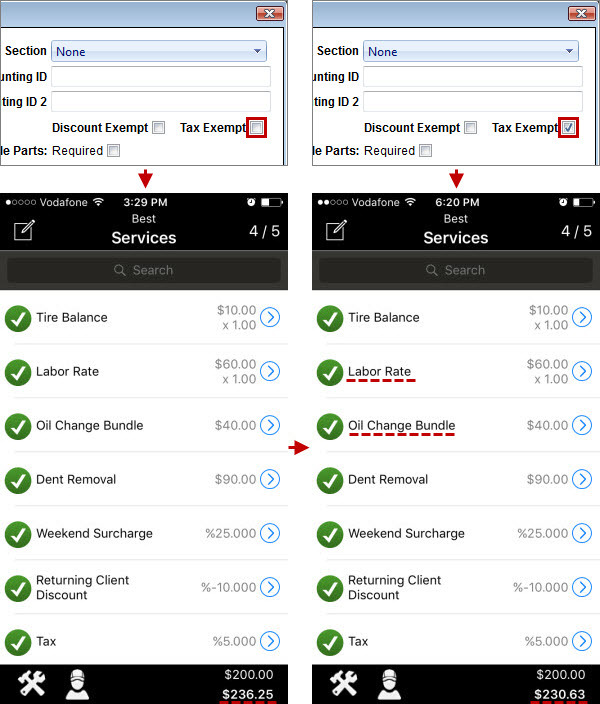 The Labor price type requires the LaborPriceType feature. 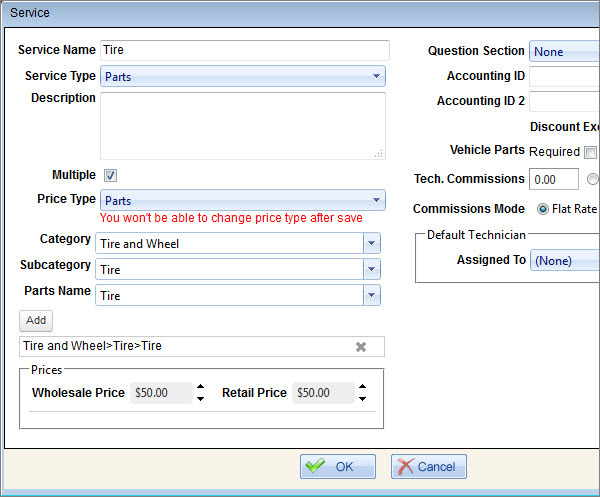 The Parts price type requires the Basic Parts feature. The Price Matrix price type requires the Hail Damage Package feature. The Bundle price type requires the Bundles feature. 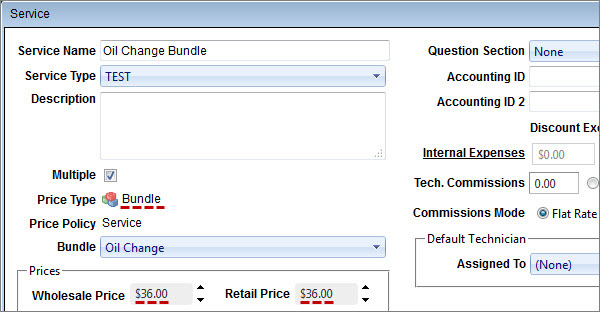 The Fee Bundle price type requires the FeeBundles feature. There are simple price types and complex price types. 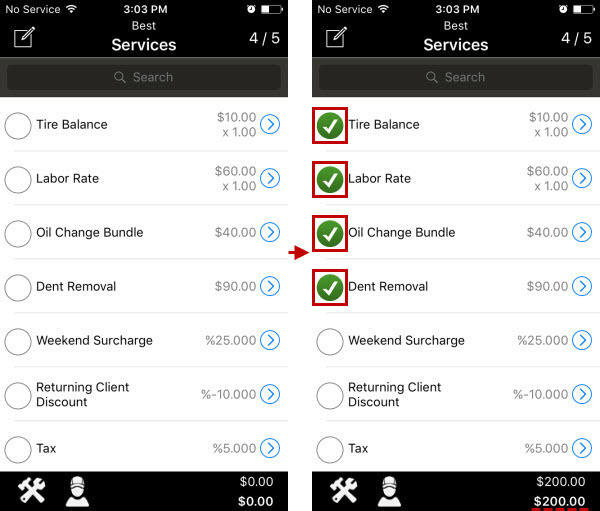 Services with a simple price type, such as Money, Labor, Parts, and Percentage, don’t include other services or subitems. 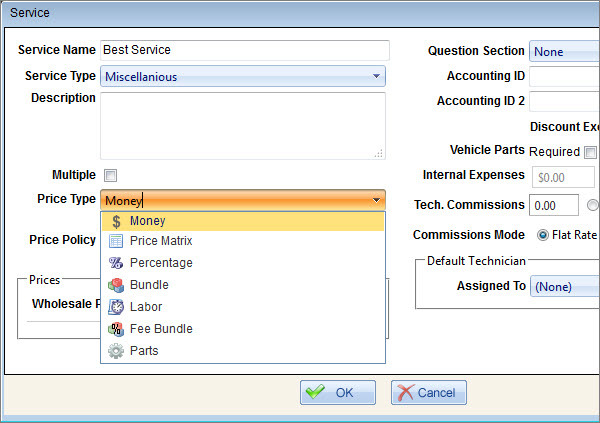 Services with a complex price type, such as Price Matrix, Bundle, and Fee Bundle, include other services or subitems. 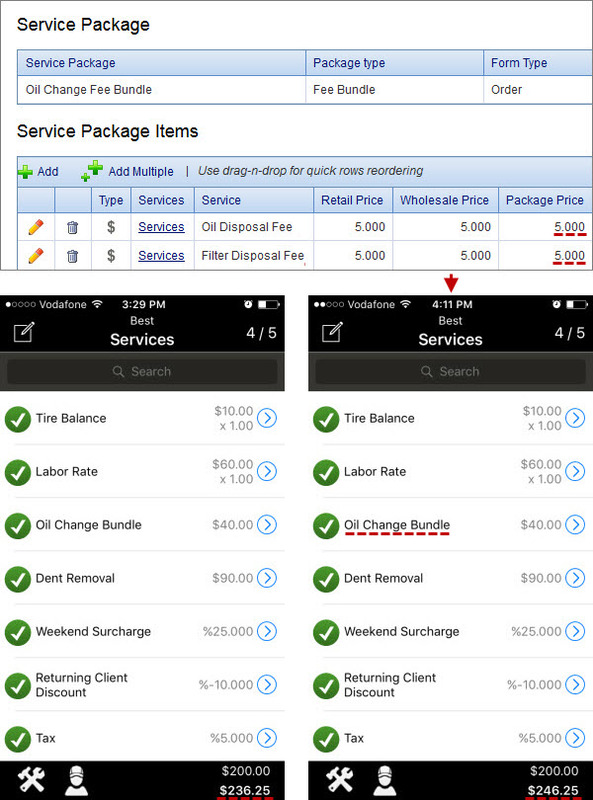 ...while the Oil Change Bundle service is a service with complex price type (Bundle). 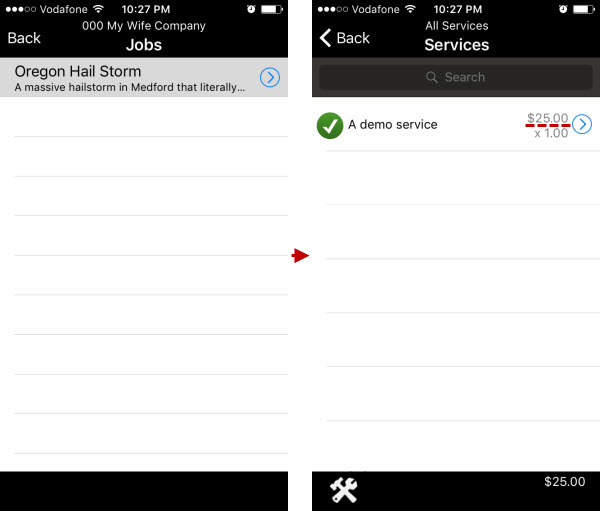 so when you tap it on the Services screen, you see the list of services it includes. The Money price type can be used for services with a fixed price. For example, if your company offers tire balancing for a fixed price, you can create the Tire Balance service with the Money price type. Note Services with the Money price type can be also used as surcharges, discounts, and taxes with fixed price, but while calculating inspection amount or work order amount they will be calculated the same way as all other services with the Money price type. The amount of money services is calculated as price multiplied by quantity. For example, if the price is $8.00 USD and quantity is 4, then the money service amount is $32 USD (8*4). Important! If your Back Office application is subscribed to the Price Policy feature, the amount of services with the Money price type is calculated based on their price policy. 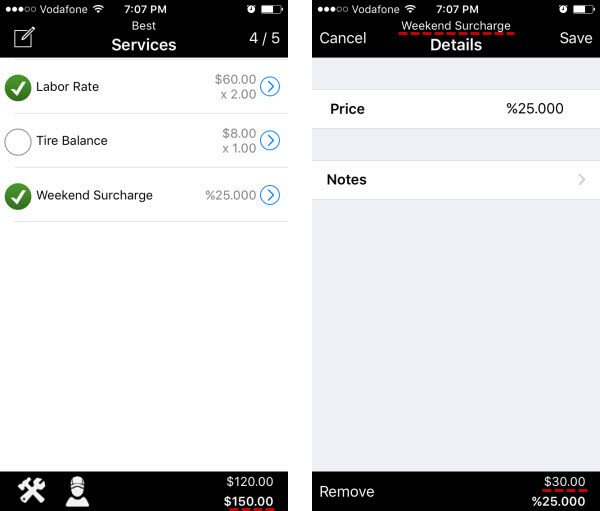 The Labor price type can be used for services charged per hour. For example, if your company technicians provide services which amount depends on the number of hours spent on work, you can create the Labor Rate service with the Labor price type. The amount of labor services is calculated as price per hour (rate) multiplied by quantity of hours (time). 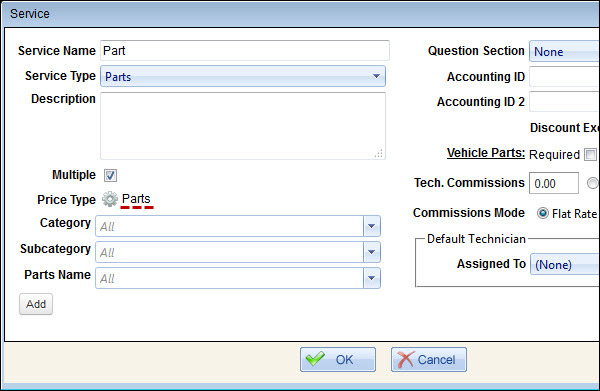 ...then its default time is automatically adjusted based on vehicle type, when the appropriate vehicle part is a selected. 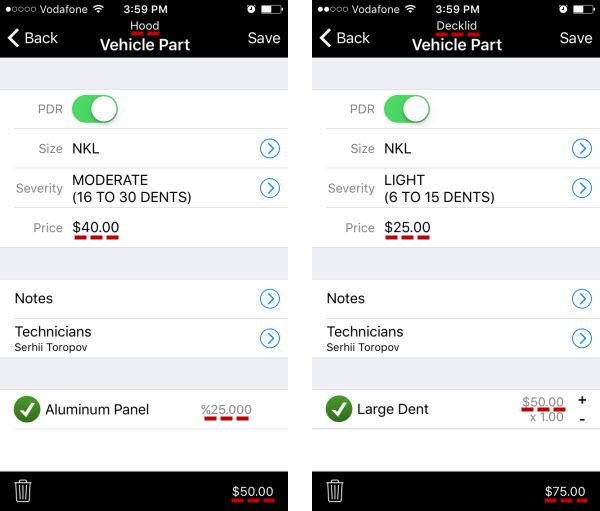 The Parts price type can be used for services that allow selecting a particular spare part from a built-in parts catalog. For example, if your company offers replacement of damaged parts, you can create the Part service with the Parts price type. Note You can create uncategorized, partially-categorized, and categorized part services. If service category, subcategory, and part are not specified, technicians must select service category, subcategory, part, and part position (if available) on device. If service category is specified, or both category and subcategory are specified, but part is not specified, technicians must select part and part position (if available) on device. If service category, subcategory, part, and price are specified, technicians must select only part position (if available) on device. Important! 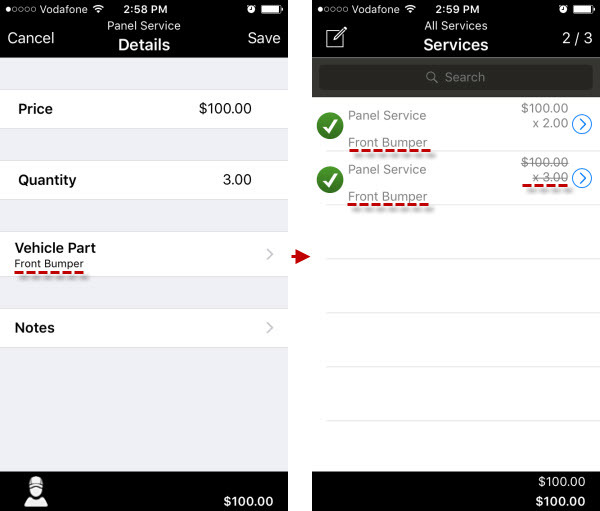 You can set service price only if service part is specified. If service price is not set, technicians can enter it on device. If service price is set, technicians can still change it on device. The amount of part services is calculated as price multiplied by quantity. For example, if the price is $50.00 USD and quantity is 4, then the part service amount is $200 USD (50*4). Surcharges are percentage services with a positive value. For example, if your company is open on Saturday or Sunday, you can create the Weekend Surcharge service with the Percentage price type and a positive Percentage value. The amount of surcharge services is calculated as percentage from the amount of main services. 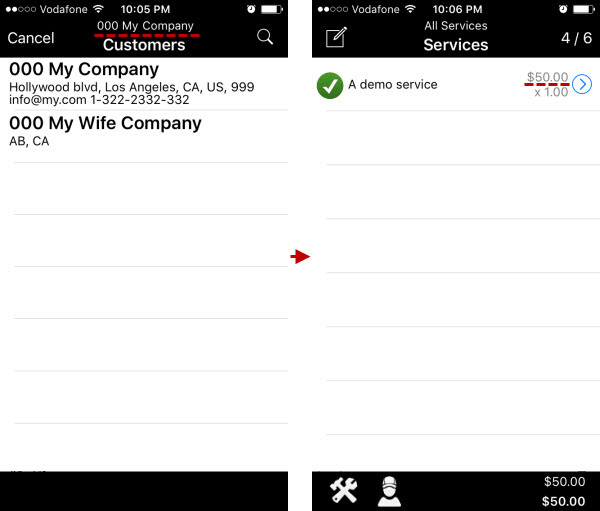 Discounts are percentage services with a negative value. For example, if your company offers discounts to regular customers, you can create the Returning Client Discount service with the Percentage price type and a negative Percentage value. The amount of discount services is calculated as percentage from amount of main services. Taxes are percentage services with a positive value and selected “Is Tax” check box. 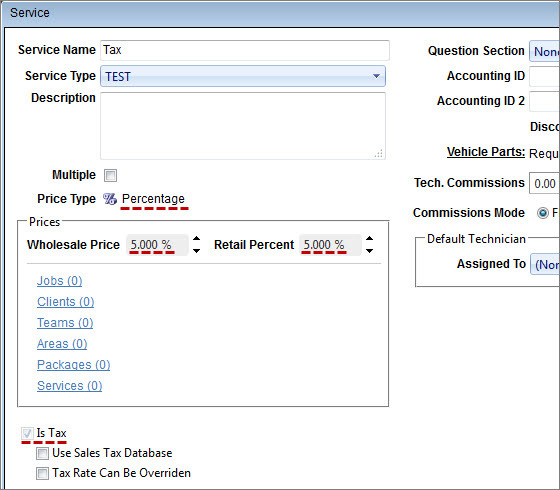 For example, if your company wants to add tax to inspections and work orders, you can create the Tax service with the Percentage price type, a positive Percentage value, and selected Is Tax check box. The amount of tax services is calculated as percentage from amount of other services. 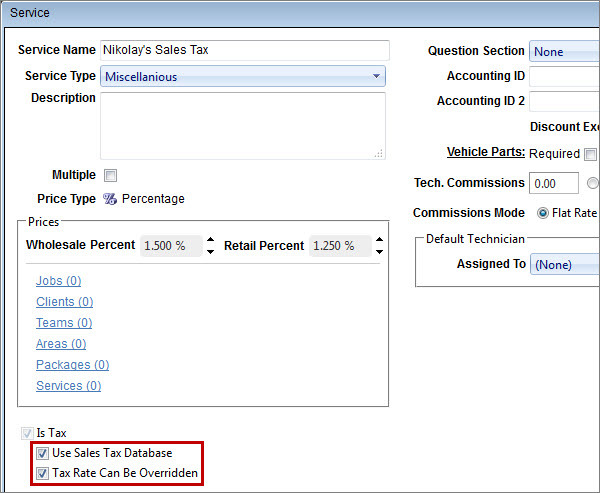 Note The Sales Tax Services and ServiceSalesTaxDatabase features provide additional settings for Avalara Sales Tax subscribers. 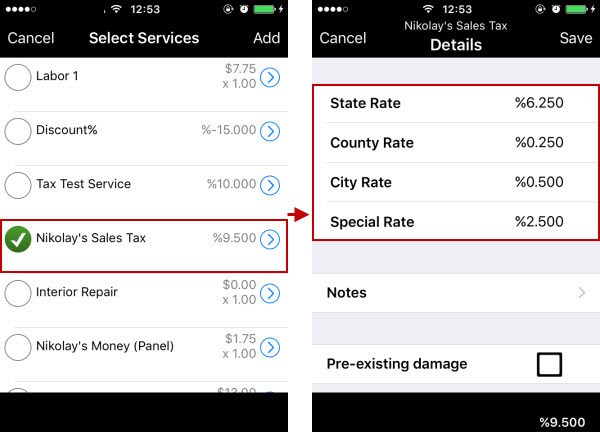 ...then the tax rate of percentage service can be adjusted automatically based on customer location (ZIP Code). 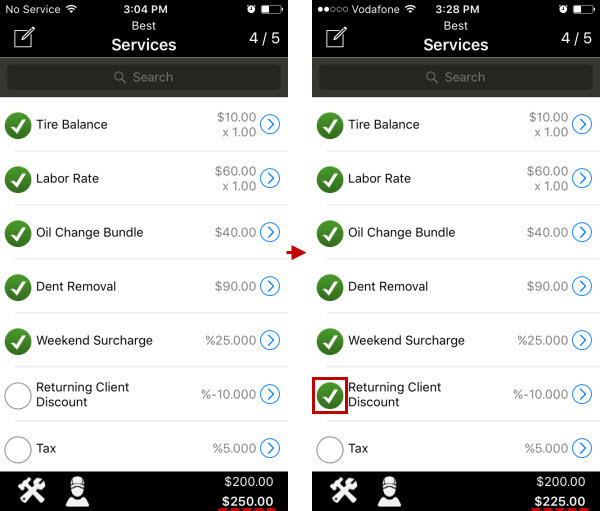 Tip If the Tax Rate Can Be Overridden check box is also selected, tax rates on the service Details screen can be changed on device. 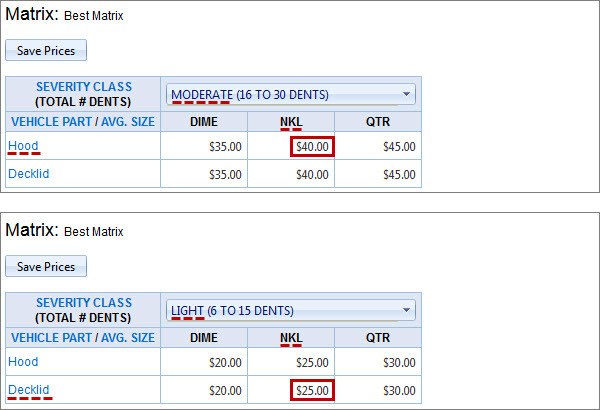 The Price Matrix price type can be used for dent repair services. For example, if your company provides hail damage repair, you can create the Dent Removal service with the Price Matrix price type. Tip The Wholesale Price and the Retail Price settings are not taken into account while calculating price matrix service amount, so you can disregard them. The amount of price matrix services is calculated based on price matrix settings and amount of additional services assigned to vehicle parts. ...and the price matrix service amount is $125.00 USD (50+75). The Bundle price type can be used for services that can group multiple services. 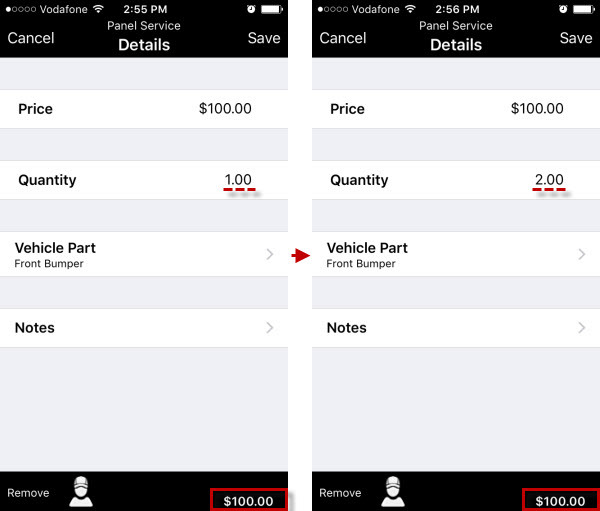 Note Only services with the Money, Labor, Parts, and Percentage (except for Taxes) price types can be included to a bundle service. 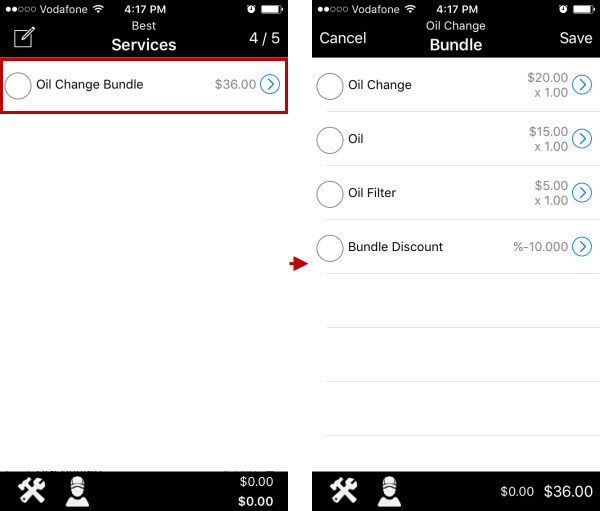 For example, if your company encourages customers to buy the whole Oil Change package, you can create the Oil Change Bundle service with the Bundle price type. Tip Enter the Wholesale Price and the Retail Price settings after calculating the total of included services. 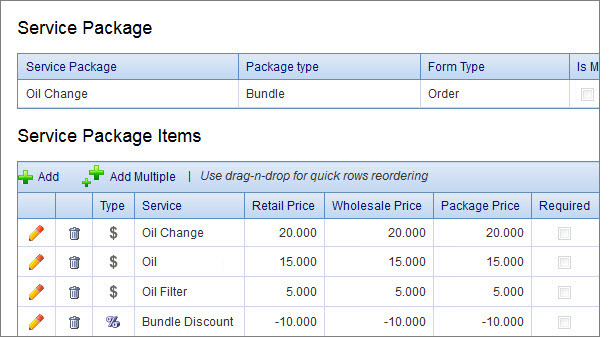 The amount of bundle services in a work order is calculated as the total amount of services (bundle service items) they include. ...and if you create a work order from an inspection with a bundle service, you need to select bundle service items for the copied bundle service. 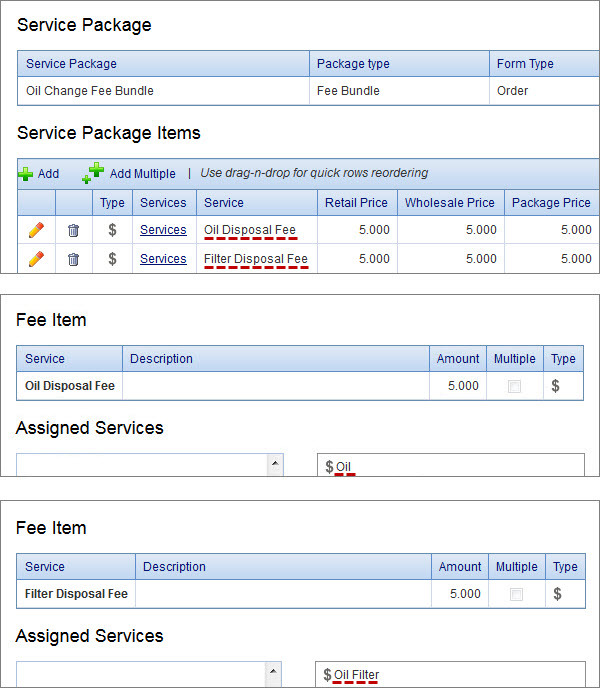 The Fee Bundle price type can be used for services that automatically add a fee amount if certain services are added to work orders. Important! Fee Bundle services are not supported in inspections (only in work orders). Note The fee bundle can contain services with the Money price type and the Percentage price type. 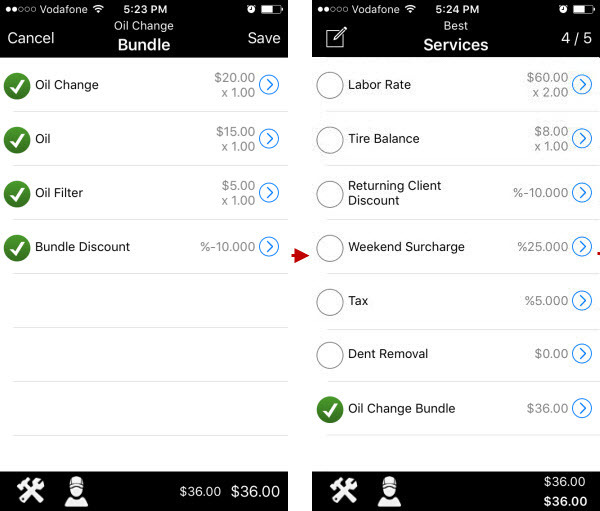 For example, if your company charges disposal fee for changing oil, you can create the Oil Change Fee Bundle service with the Fee Bundle price type. Tip The Wholesale Price and the Retail Price settings are not taken into account, so you can disregard them. 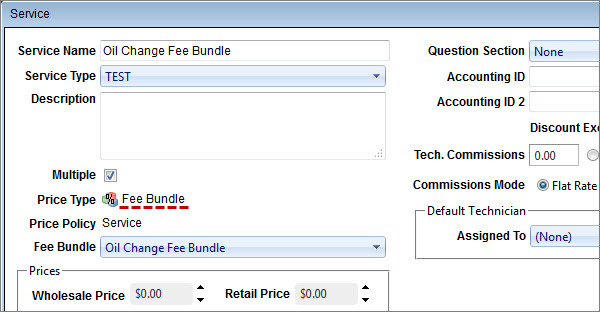 The amount of fee bundle services is calculated as the total amount of selected services (fee bundle service items) which are added to their fee bundle package. 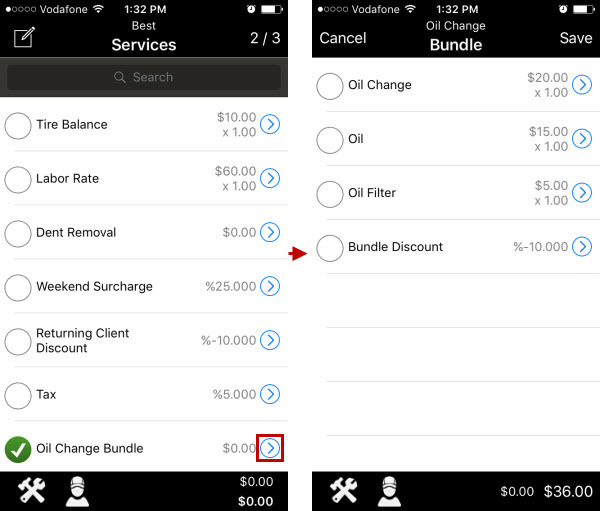 ...then when the Oil service is added to a work order, the Oil Disposal Fee $5.00 USD is added to the total, and if the Oil Filter service is also added to an inspection or a work order, the Oil Filter Disposal Fee $5.00 USD is added to the total, so the fee bundle service amount is $10 USD. The same way the total amount of work order is increased by $10 USD when the Oil Change bundle service, which includes both the Oil service and the Oil Filter service, is added. Price policy defines how service amount is calculated based on service price and quantity, as well as how work order amount or inspection amount is calculated based on service amount and number. 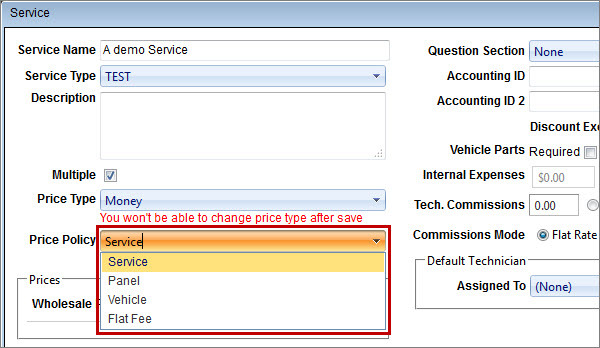 Note You can set price policy for services with the Money price type only. 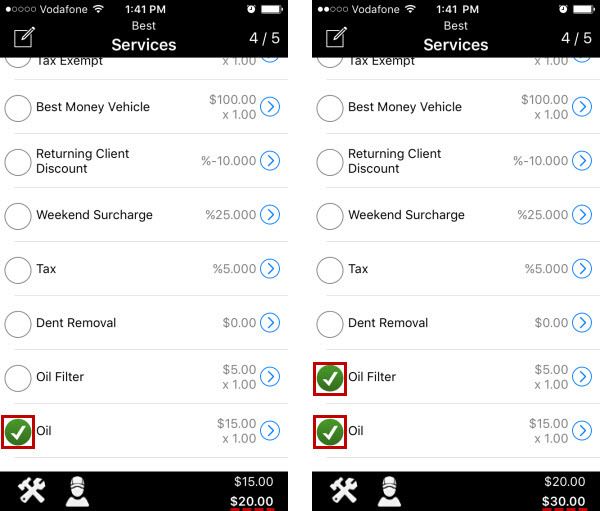 Services with other price types have the Service price policy by default. 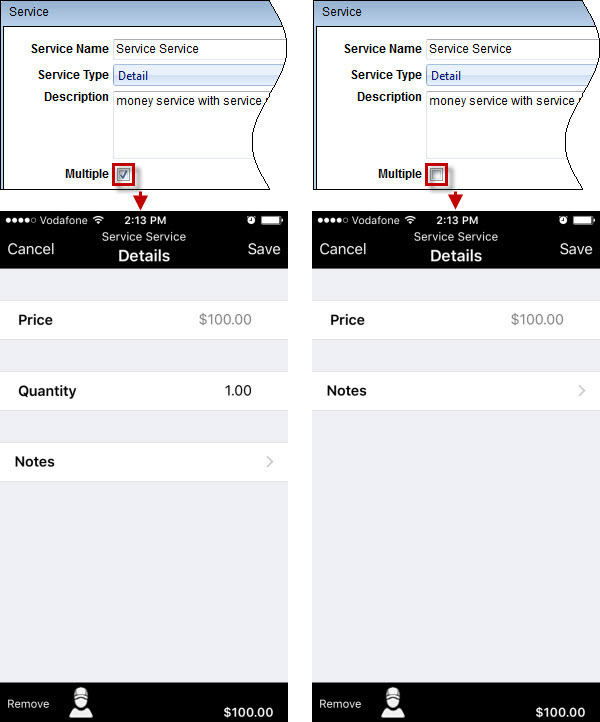 Note You can change the quantity of a service on device only if the Multiple check box is selected for the given service. 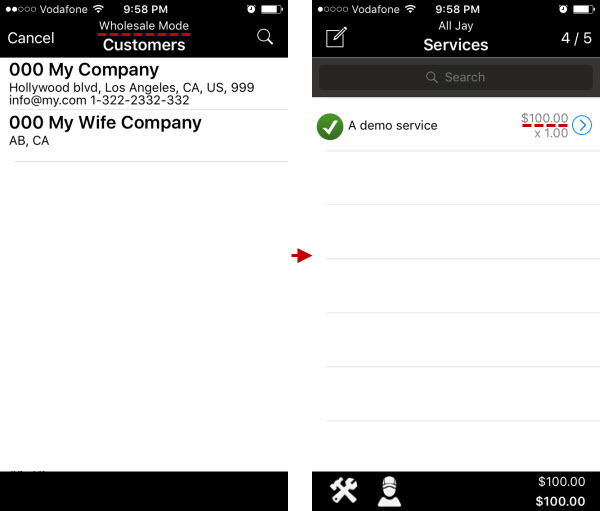 Also, if the Multiple check box is not selected for a service, you can add this service to a work order or an inspection only one time (added service will not be shown in the list of available services). 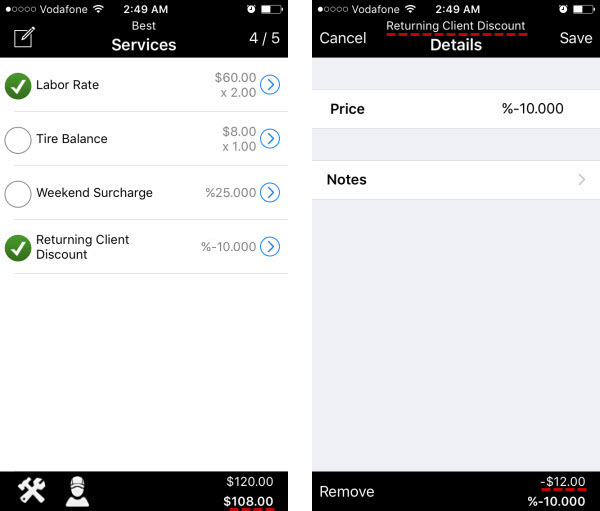 For example, if service price is $100 USD and quantity is 2, then service amount is $200 USD (2*100). Work order amount or inspection amount depends on how many times this service is added. For example, if you add this service again with quantity 3, then work order amount or inspection amount is $500 USD ((2*100)+(3*100)). Work order amount or inspection amount does not depend on how many times this service is added. For example, if you add this service again, then work order amount or inspection amount is still $100 USD (only one of the services is taken into account). Note If the price of a service, which is added multiple times, is different, only the service with the biggest price is taken into account. For example, if the price of one service is $100 USD and the price of another service is $50 USD, $50 USD are not added to work order amount or inspection amount. For example, if service price is $100 USD and quantity is 2, then service amount is still $100 USD (only service price is taken into account). Work order amount or inspection amount does not depend on how many times this service is added for the same panel. For example, if you add this service for this panel again, then work order amount or inspection amount is still $100 USD (only one service for the same panel is taken into account). 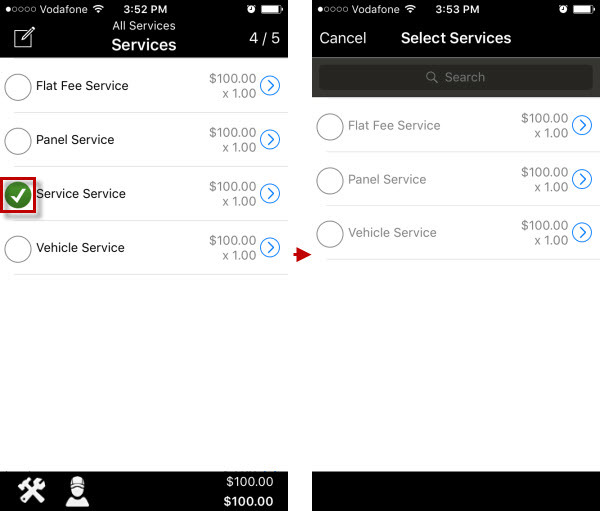 Note If the price of a service, which is added multiple times for the same panel, is different, only the service with the biggest price is taken into account. For example, if the price of one service is $100 USD and the price of another service is $150 USD, $100 USD are not added to work order amount or inspection amount. For example, if you add this service again, then work order amount or inspection amount is $200 USD (100+100). 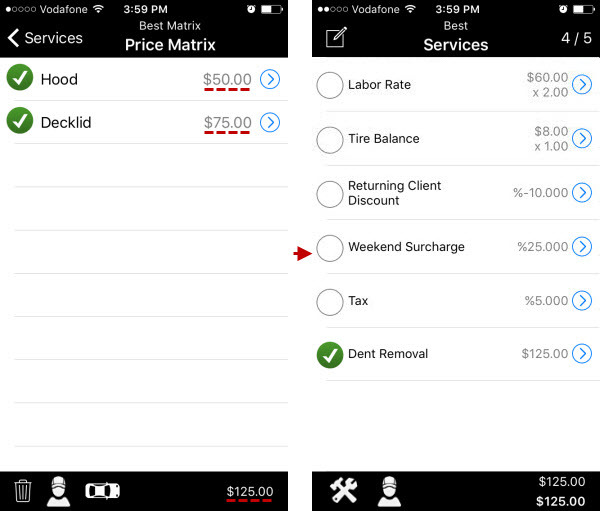 Price adjustment defines how service price can be automatically changed based on price category. Note The categories list is sorted by priority from low to high, so when price adjustment is set for more than one price category, the price category with the highest priority is used. For example, if both area prices and team prices are set, the team prices are used. 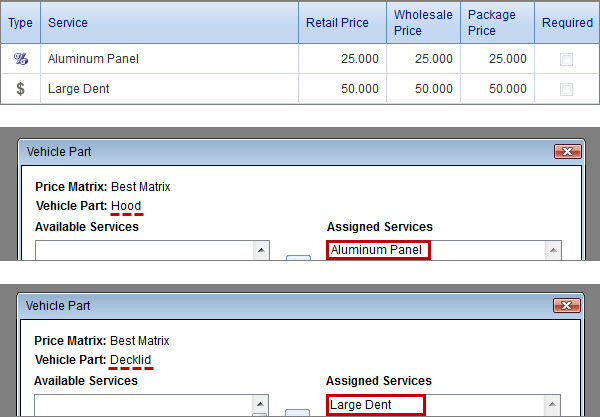 Tip You can create multiple prices with different effective dates for each category. For example, if you want service price to be automatically changed for the summer season, you can define appropriate prices and dates when these prices become effective. Important! Besides price categories, you can also configure Discount & Fee Prices. You can set a different service price for wholesale clients and retail clients, so that when you add a service to an inspection or a work order, service price can be automatically adjusted depending on the client type. ...however, when you add the same service while creating a work order for a retail customer, service price is $125.00 USD. You can set a different service price for various service packages which can be assigned to inspection types and work order types, so that when you add a service to an inspection or a work order of a particular type, service price can be automatically adjusted depending on the assigned service package. ...when you add this service while creating a work order to which this service package is assigned, the service price is $75.00 USD. 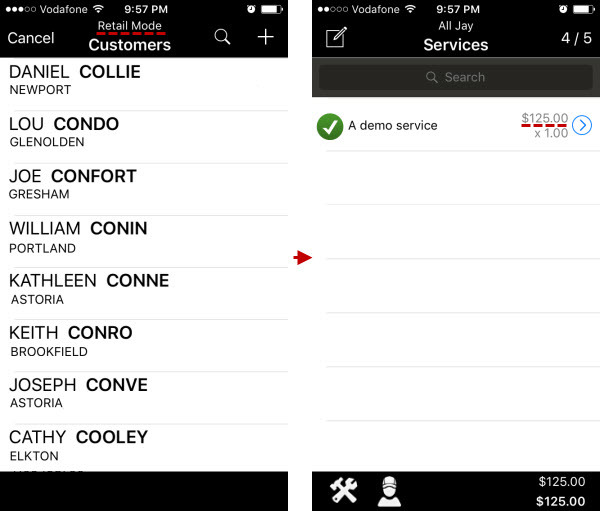 You can set a different service price for different areas, so that when technicians from a particular area add a service to inspections and work orders, service price can be automatically adjusted. ...when technicians from this area add this service while creating an inspection or a work order, the service price is $70.00 USD. 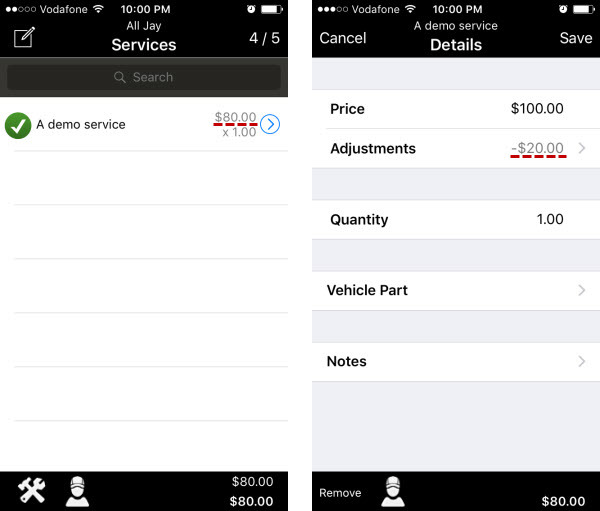 You can set a different service price for different teams, so that when technicians from a particular team add a service to inspections and work orders, service price can be automatically adjusted. ...when technicians from this team add this service while creating an inspection or a work order, the service price is $60.00 USD. You can set a different service price for different clients so that when you add a service to an inspection or a work order, service price can be automatically adjusted depending on the selected customer. 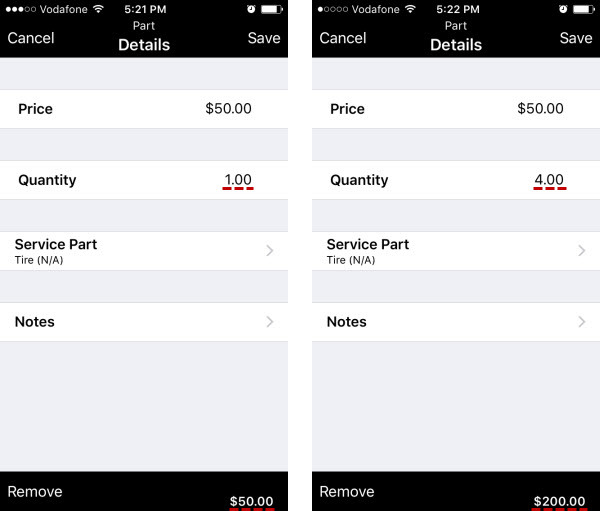 ...when you add this service while creating a work order for this customer, the service price is $50.00 USD. Note You can specify different price for different clients if your Back Office application is subscribed to the PricesPerCustomer feature. 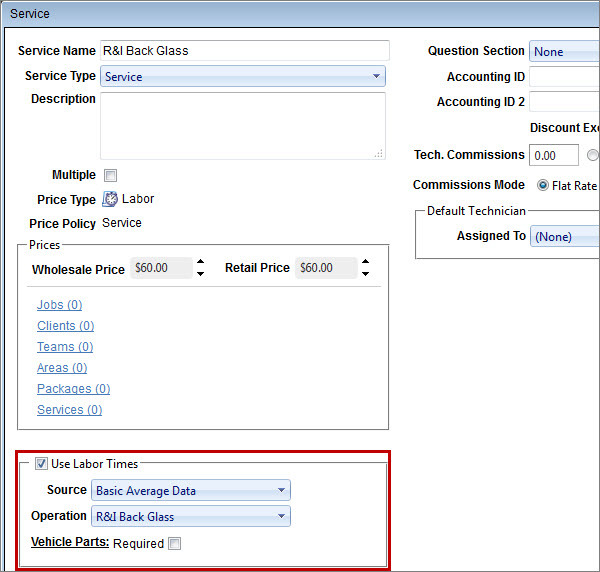 You can set a different service price for jobs so that when you select a particular job while creating a work order for a particular wholesale client, service price can be automatically adjusted. ...when you add this service while creating a work order to which this job is assigned, the service price is $25.00 USD. You can set a service discount or fee, so that when you add a service to an inspection or a work order, service price can be automatically adjusted depending on the discount or fee rate. 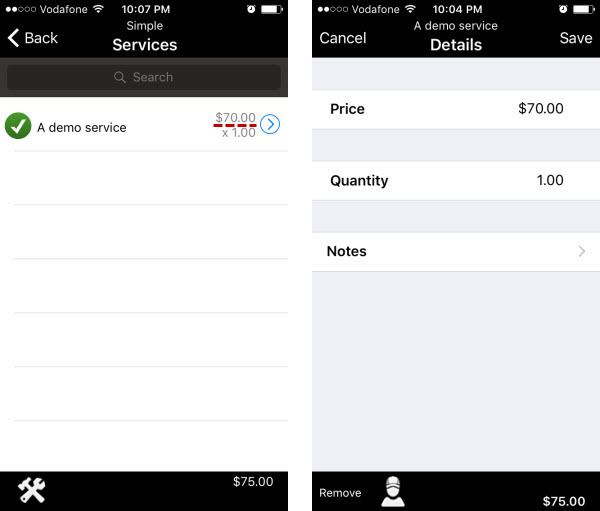 ...when you add this service while creating a work order for a wholesale customer, the service price is $80.00 USD ($100.00 USD - 20% is $80.00 USD). ...when you add this service while creating a work order for a wholesale customer, the service price is $120.00 USD ($100.00 USD + 20% is $120.00 USD). Subtotal amount of inspections and work orders is the summary amount of main services, while total amount is the sum of subtotal amount and surcharges, discounts, taxes, and fees, if any. Main services are services with the Money price type, the Labor price type, the Parts price type, the Price Matrix price type, and the Bundle price type. 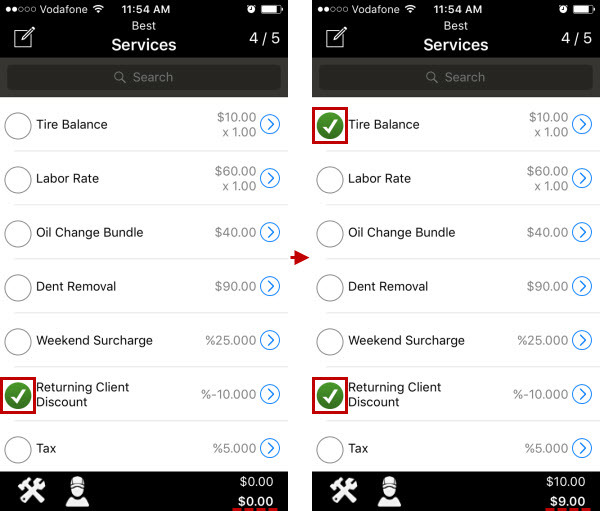 Surcharges, discounts, taxes, and fees are services with the Percentage price type and the Fee Bundle price type. Note Adding surcharges, discounts, and taxes to inspections and work orders without at least one main service doesn’t make sense. For example, if you select the Returning Client Discount service only, the total amount of an inspection or a work order doesn’t change until you select the Tire Balance service. If there are only main services, the amount of main services is summed up. Note In this case subtotal amount equals total amount. If there are also any surcharge services, the amount of surcharge services is calculated from the amount of main services, and then added to the total amount. 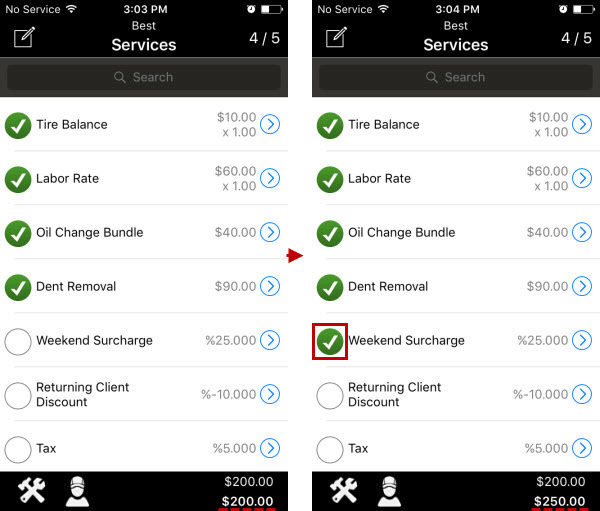 For example, if the Weekend Surcharge service amount is 25%, then the amount of main services with surcharge is $250.00 USD (25% from 200 is 50; 200 + 50 is 250). If there are also any discount services, the amount of discount services is calculated from the amount of main services with applied surcharges, and then added to the total amount. Note The discount amount is a negative value, so “adding” discount amount actually means “deducting” it). For example, if the Returning Client Discount service amount is -$10.00, then the amount of main services, surcharge service, and discount service is $225.00 USD (-10% from 250 is -25; 250 - 25 is 225). Note The amount of discount services is not calculated from main services with the Discount Exempt setting. Important! Discount is also not calculated from surcharges of main services with the Discount Exempt setting. 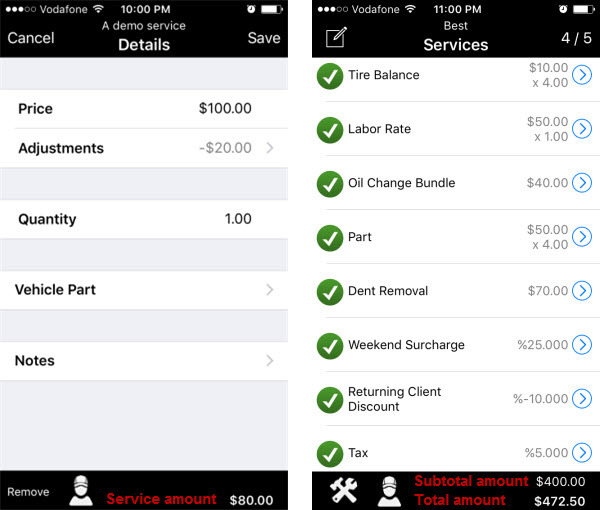 For example, if the Tire Balance service and the Dent Removal service are discount exempt, the discount is not applied to both the amount of these services and their surcharges. If there are also any tax services, the amount of tax services is calculated from the amount of main services with surcharges and discounts, and then added to the total amount. For example, if the Tax service amount is 5%, then the amount of main services with surcharge, discount, and tax is $236.25 USD (5% from 225 is 11.25; 225 + 11.25 is 236.25). Note The amount of tax services is not calculated from main services with the Tax Exempt setting. Important! Tax is also not calculated from surcharges and discounts of main services with the Tax Exempt setting. For example, if the Labor Rate service and the Oil Change Bundle service are tax exempt, the tax is not applied to both the amount of these services and their surcharges and discounts. If there are also any fee bundle services, the amount of fee bundle services is calculated, and then added to the total amount. Note Fee Bundle services are not shown in the list of services on device.